For it is within you that the Kingdom of God dwells"
The Gospel of Mary is an extraordinary ancient document of Mary Magdalene's teachings. rediscovered at the end of the 19th century in Egypt. 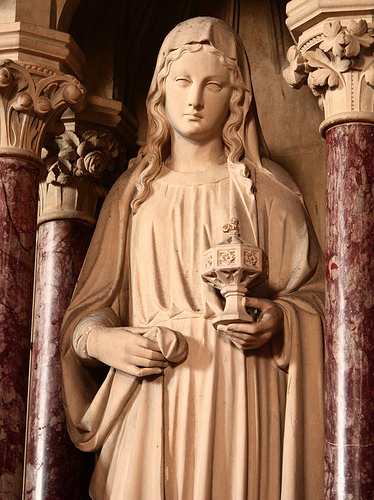 In it, Mary Magdalene is depicted as the spiritual leader who guides the disciples after Jesus' death. She strengthens their courage and reveals an inner vision and teachings that Jesus gave to her alone. Harvard professor Karen King writes that this is a work that can " lead the reader inward toward the identity, power and freedom of the true self, the soul set free from the Powers of Matter and the fear of death.” . It is a book that has much to teach us about finding inner truth and the liberation from ignorance. In our three week seminar, we will delve into this fascinating text, explore its Gnostic background, and discover the illuminating parallels with Depth Psychology and Dante. Each week will consist of teaching, personal reflection, small group discussion and Lectio Divina, an ancient Benedictine practice of awakening the imagination. In this seven part audio course, we will encounter Mary Magdalene in her many faces of sensuous “fallen woman”, disciple, apostle, witness, teacher and embodiment of wisdom in both canonical and Gnostic Gospels, French legends, and poetry.